The following is the final in my left-handed infielder series. Check out the details on left-handed second basemen and left-handed third basemen. Both of my previous ventures into the world of left-handed infielding have yielded interesting results that had stories beyond the concept of a man whirling around to throw to first base. Such is not true of the Baseball-Reference play index revealing left-handed shortstops since 1956. That's because there are none. Sure, the search has three men listed; but a quick investigation shows that Mark Ryal, Tom Chism, and Royle Stillman never played the field in those games. Each time, the supposed lefty shorstop batted just once, in the top of the first inning, and was removed for a replacement in the bottom of the first inning. "When my team was on the road, I would list someone else as our leadoff hitter and shortstop. Often it ws Royle Stillman, a young outfielder we had brought up from Rochester. Stillman would bat in the top of the first, and then Belanger would go in to play shortstop in the bottom of the inning.... I used this strategy only in September, when the roster swelled from twenty-five to forty and we had plenty of players available.... Usually Mark Belanger was the one who suffered. It hurt him to lose that at bat.... Mark was too upset to think what's best for the team. What the hell, Stillman went four for nine and got on base half the time. It's hard to argue with those results." Well, except that stubborn argument known as "small sample size." But, who am I to argue with Earl Weaver? I also figured out a new way to search on baseball-reference.com: through the Batting Seasons Finder, I can pare down statistics for lefty shortstops. Here are the results. Clearly, it was a lot more common for left-handed throwers to play shortstop before the 20th century. Over in the "Pos" column, an asterisk notes a primary position. The most recent asterisk is for Russ Hall, who played 36 career games at shortstop in 1898 and 1901. Before Stillman, the most recent appearance of a left-hander at the shortstop position was Lou Gehrig in 1934. According to this article, Gehrig had suffered an attack of lumbago in the previous game and was inserted as the leadoff hitter (listed as shortstop), singled in one at bat, and was removed from the game to keep his streak alive. So when was the last fielding chance by a left-handed shortstop? Hal Chase played one game at short in 1909 but had no fielding chances; he did have three put-outs in two games at short in his 1905 rookie season. Mike Donlin played until 1914 but his lefty short-stop days were over by 1902. The aptly named Lefty Davis played one game at short in 1903 (and one game at second in 1901), and everyone else on the list played prior to 1905. So it appears that Hal Chase, sometime in 1905, had the last fielding chance by a left-handed throwing shortstop. It was Donlin, in 1902, who was the last man to make a throw to first base left-handed. Long-standing tradition is the most plausible explanation why. A google search reveals this article from the BBC, explaining that left-handed children can't play the infield (other than first base). Their reasoning- "it just doesn't happen." There's also some hand-waving about the inability of left-handed throwers to make the throw quickly enough. This I don't particularly understand. I'm right-handed myself, but in writing these I've imagined the movements necessary to play the positions left-handed. For shortstop, the distinction makes the least amount of sense. The only disadvantage I can think of is the ability to look back a runner on third before throwing to first base. My internet investigation uncovered a few other interesting tidbits. 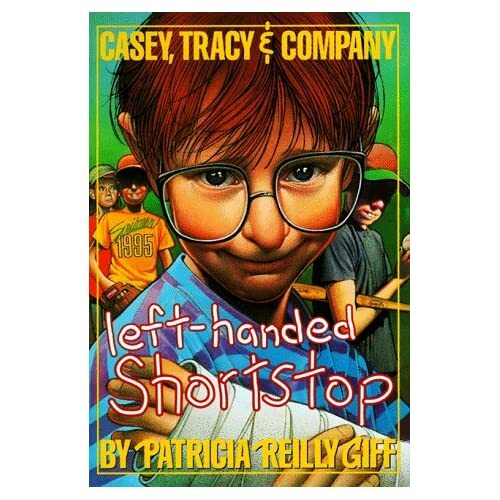 First, there's a book called "Left-Handed Shortstop," apparently centered around a kid whose manager doesn't want to tell him that lefties can't play short. Also there was a college shortstop in softball a few years back who won the position in an open competition, despite being left-handed, and caused a sensation in the NAIA. Considering the shorter softball basepaths and quicker reaction times, I doubt that this player had the so-called problem of throwing to first-base quickly. It's looking more and more that the bias against left-handed infielders is due to the vagaries of baseball tradition more than anything else. In addition, the notion in the article about left-handed catchers may be valid: if you're a kid and you're left-handed, chances are the manager is going to try you at pitcher. He might stick you in the outfield on non-pitching days, due to tradition, and the dearth of lefty infielders continues. I suspect the bias against lefty shortstops is because they would have trouble with ground balls up the middle, not because of the quarter-turn they would have to make to throw to first. I would think a lefty would have an advantage on a ball up the middle since they don't have to turn around to make the throw - similar to the way a second baseman fields a ball up the middle. However, balls towards third base would be extremely difficult as you'd be moving away from first - longer throw that you'd have to set for rather than making it on the run. A Left-handed SS glove would be on the inside of the base path when catching a ball from the right side of the infield which means when a runner is coming into 2nd there would be a greater chance of the ball hitting the runner. Which means the runner would be safe. Also like stated in the BBC link it takes them longer to go to first. Even a hartbeat slower could make the difference from an out to the runner being safe. The reason it takes longer to go to first for a left-hander is the mechanics of throwing. Your non-throwing shoulder is aimed at your target. So for a lefthander moving to his left he has to spin 180 to throw to first. This is also why a third-baseman is also always righthanded. It means that the SS is less likly to range right with the 3B being able get better angles/easier plays to first then the SS. My left handed son has the solution to this problem. Switch first and third base every other game or inning. This renders the advantage of throwing right handed moot on days when first base is down the left field line. I liked to play left handed at short and at third. It was in softball and I had some success. But...against fast runners it was a disadvantage because of the quarter turn i had to make. Now for catching. I am not convinced a left hander is at permanent disadvantage. I think a left handed catcher could practice technique to dela with right handed hitters on his throwing arm side of the plate. I think the fact there have been few lefty catchers is baseball prejudice. It's not just a bias or a tradition - Shortstop (and the infield in general, but especially short) is all about rhythm and flow - You need to be moving toward first as you field and have the proper momentum. It's not just that you need to make the 180-degree turn (which by itself would be enough to disqualify you at a level as high as MLB) but you would need to generate all of your power on your own, as well as take the time to properly square up after the transition.